H.A. King’s 2100 Series Bushing and Snubber features a steel tube and two rubber rings which encapsulate steel rings to provide reinforcement. The 2100 Series Bushing and Snubber Mounts provide an effective means of reducing noise and vibration in a fail-safe mounting system. 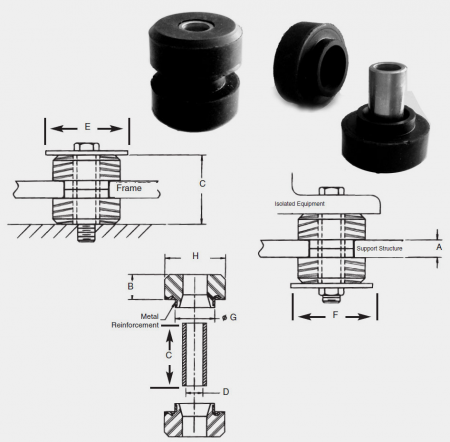 These mounts offer a wide range of vibration isolation. They are compatible with a support structure thickness greater than 1/2″ and accommodate 1/2″ diameter bolts. The 2100 Series Bushing and Snubber Mouunts are an ideal choice for mounting applications such as radiators, vehicular cabs, engines and generators.